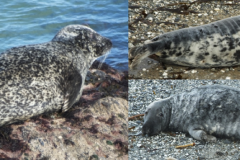 What a surprise to find adult male ‘8 Horns’ resting peacefully on the foreshore during my routine West Cornwall survey last week! He is a bit of a celebrity you see! In the seal world we never know who will catapult themselves to fame next and this was 8 Horn’s turn! 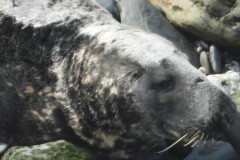 Ellis is a common (or harbour) seal, and contrary to their name, common seals are very uncommon around the coast of Cornwall.